[dropcap]T[/dropcap]witter like most social media channels is a sea of endless noise. So how do you really to reach out and shine above the masses? I have listed 12 Business Twitter Tips to get more followers that you need to consider when you want to increase your Business’ following on Twitter! The more visibility you get, the greater the chance that your following will increase. Quite logical, right? So, where do you add links for best effect? On your website, as visible as possible and preferably in the form of a Twitter icon that visitors quickly recognize. Think about how visitors navigate on your side, how is it structured? Fit it to add icons at the top of a menu, or perhaps in the footer? Choose a place that feels logical and is easy to find. If you have trouble finding a fit place? Create a sticky on your landing page with your social icons that accompany the edge of the page when the visitor scrolls. In your email signature along with an interesting catch phrase which increases the chance that the reader will be curious and click through. In your blog and on your contact page. On other social media channels. Have a company Facebook, Google+ or Instagram? Include it there as well. Think outside the web! Print icon the related link on your graphic materials such as business cards, brochures, flyers and other promotional materials. Encourage your employees to be company advocates and post a link on their own Twitter accounts, blogs, company emails, and other social channels they may use. Keep your branding consistent. Make sure that you have a consistent graphical look both on your website and on social channels where you are active. Consider how you want your company to be perceived and strive therefore to your profile pages look as similar as possible. You don’t want to risk a bad visitor experience, or possibly losing a visitor because they thought they surfed to the wrong business. … Um okay I’m not talking about cute cats or some crazy trending meme picture because your visitors will flinch. Use your logo (or icon) as profile picture and cover photo that fits your company’s profile. If it’s a personal picture, always remember to smile! This is the fun part! On your Twitter page, you have the chance to present your company and strut your stuff. Let the entire world know why you are the very best at what you do. Remember this represents your online reputation, so be sure to rock it. Your challenge: Keep you bio/description within 160 characters! Try to toss in a couple of important keywords that will help you get higher up in the search engines. This will also show up in Google search results when a person searches for your business. Don’t forget to include a link to your Company’s website and location. 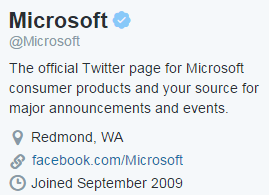 Take a look at the below example from Microsoft’s Twitter page. There is no magic number for how often you should post a tweet, but studies have shown that the companies that tweet are usually also the ones that attract the most followers. How often is “right”, however, varies greatly depending on what kind of business, industry or product concerned. Research on how other companies in your industry are doing, how often tweet them, what tweet them and they get no response? Once you have done a competitor analysis, it is then easier to set goals for your own actions, which you of course should strive to become even better! Something that is good to keep in mind is that the most important thing for a successful twitter strategy isn’t the number of tweets, but what you actually say. Do not throw up a bunch of tweets just because you have not tweeted in a while, it will dilute your account and create risk that your followers will view your content as amateurish or spam. 6. What should you tweet? – Start from your target audience! Remember it’s all about your target audience. Start by finding out what they want to see in your stream. What is it that makes them want to follow you in particular? What tips would be appreciated and what kind of language drives home the best? It may sound like an unreasonable goal, but the focus isn’t just to be an expert in your industry, the goal is to become an account of your followers are talking about – and in the best case recommend you to others! In other words, Tweet not only for the sake of it – Tweet with quality. Indifferent and rigid texts without personality will never be able to truly touch others. And that is exactly what you want, touch and get the person on the other side of the screen to know that it is actually a real person in front of them and not a dead brand without soul. Find a tone you are comfortable with and try to keep the language as uniform as possible so that you are not perceived sprawling with several different “personalities”. Dare to get close to your target audience and challenge yourself in how you write – aim to stand out from the crowd in the right way. You will not regret it, you will wonder why you have not fixed it before! Cheap or free software such as Hootsuite allows you to schedule your posts so that you maintain a constant flow without the need to post in real time. No one has the desire or time to camp out on Twitter 24/7 … take my advice on this, it will save your tons of time! Search around for topics / tweets related to your particular business, as well as topics and issues your company is passionate about. Comment and interact! Do not stand outside and stare at it – take part in the conversation. If you find exciting posts and articles that you like -Share them! To share good content and articles within your genre works as an extension of your brand. When visitors see what you have to offer (in terms of relevant reading), it will strengthen their feeling that you are a company that knows what you are doing and have an eye on what’s happening in the industry. Inspiring quotes, funny pictures, industry-related graphs (info-graphs), images (Always include a picture with your Tweet whenever possible), links to articles and posts on trending topics. 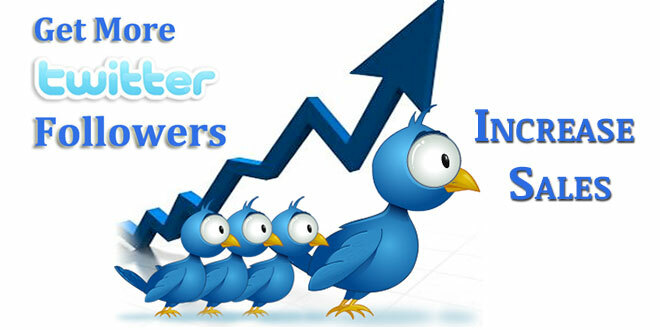 To obtain the greatest reach, you want to tweet during the time that your target audience is active & online. Do not put your energy into that tweet when your potential followers and customers are busy with other things, choose carefully out your times when you post your material so that your message is not in danger of drowning in twitter feed. So when is the best time to tweet for business? It depends entirely on how your customers and potential followers using Twitter. Did you receive a comment or rewteet on your post? Congratulations! Be sure to respond as quickly as possible and thank preferably those retweet your content! It is important to remember to not always write the same thing in the thank-you message, those visible on your side, try to write as varied and personal responses as possible. It is highly likely that the followers of your followers share the similar interests, these are also good people to follow. By using a free tool such as Tweepi you can easily see a list of accounts that follow your followers on Twitter. Follow also the accounts that Twitter itself recommends for you, the algorithm works well and most relevant people for your company. Good luck with your Twitter presence and do not forget to follow me on Twitter for more tips on Social Media, SEO & Digital Marketing.